BS7671:2008, 525.1 – In the absence of any other consideration, under normal service conditions the voltage at the terminals of any ﬁxed current-using equipment shall be greater than the lower limit corresponding to the product standard relevant to the equipment. BS7671:2008, 525.2 – Where ﬁxed current-using equipment is not the subject of a product standard the voltage at the terminals shall be such as not to impair the safe functioning of that equipment. BS7671:2008, 525.3 – The above requirements are deemed to be satisﬁed if the voltage drop between the origin of the installation (usually the supply terminals) and a socket-outlet or the terminals of ﬁxed current-using equipment does not exceed that stated in Appendix 12. 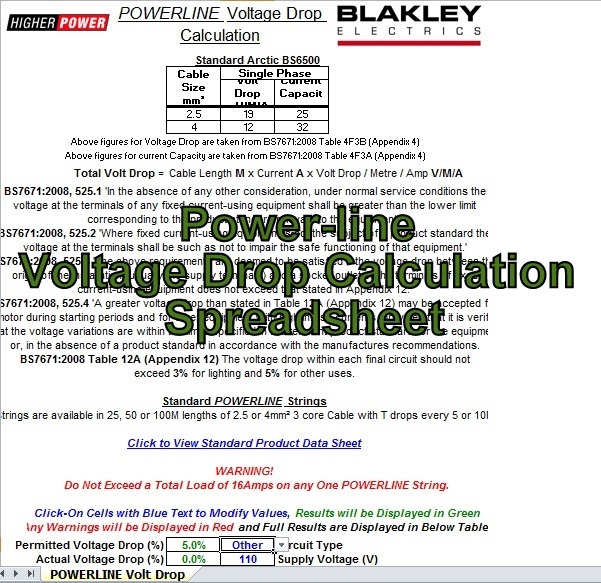 BS7671:2008, 525.4 – A greater voltage drop than stated in Table 12A (Appendix 12) may be accepted for a motor during starting periods and for other equipment with high inrush currents, provided that it is veriﬁed that the voltage variations are within the limits speciﬁed in the relevant product standard for the equipment or, in the absence of a product standard in accordance with the manufactures recommendations. BS7671:2008 Table 12A (Appendix 12) – The voltage drop within each ﬁnal circuit should not exceed 3% for lighting and 5% for other uses. Strings are available in 25. 50 or 100M lengths of 2-5 or 4mm2 3 core Cable with T drops every 5 or 10M.